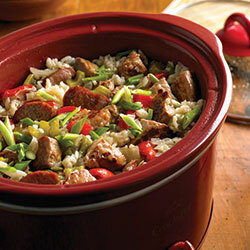 Mix all ingredients except green onions in a 6-quart slow cooker. Cover and cook on low for 5–6 hours. Watch carefully during the last 1 hour of cooking to prevent rice from overcooking. Just before serving, check seasoning and add green onions. Recipes and photos courtesy of the National Pork Board.